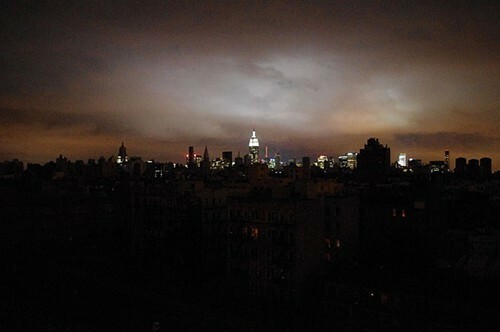 Lower Manhattan, plunged into dark by Sandy. When calamity strikes far away—say in New Jersey—we find New Yorkers concerned and reflective. The troubles of the world matter to the world's first city. But what New Republic essayist Leon Wieseltier calls "the solipsism of situatedness" rules when New York City itself is bludgeoned. As I noted in a recent Bleader post, Wieseltier's own reaction to Hurricane Sandy provided a worthy example of this solipsism. He called Sandy only "the most recent of the devastating proofs" of climate change, and thundered that "the repudiation of climate sciences deserves to be universally regarded as intellectually and socially disreputable, the ravings of cranks and the scheming of capitalists at their most contemptible." The Sunday New York Times showed that newspaper equally perturbed in its own way. The front page of the Sunday Review section offered a massive illustration of the Statue of Liberty underwater, and the headline asked, "Is This the End?" Apparently. The subhead informed us, "Whether in 50 or 100 or 200 years, there is a good chance New York City will sink beneath the sea." And the article, by James Atlas, predicted New York will go the way of ancient Rome as described by Gibbons: "The public and private edifices, that were founded for eternity, lie prostrate, naked, and broken, like the limbs of a mighty giant . . ."
Atlas concluded: "This is our fate. All the more reason to appreciate what we have while we have it."